You may not know it yet, but there%u2019s a good chance Google Shopping is your most valuable online channel. This paper will explain why Google Shopping adds more long-term value than marketplace channels, and how we work with retailers and brands by leveraging Google Shopping to build long-term, defensible ecommerce businesses. According to data from Quantcast, there were an estimated 233 million monthly unique visitors that searched Google in the United States during 2016. 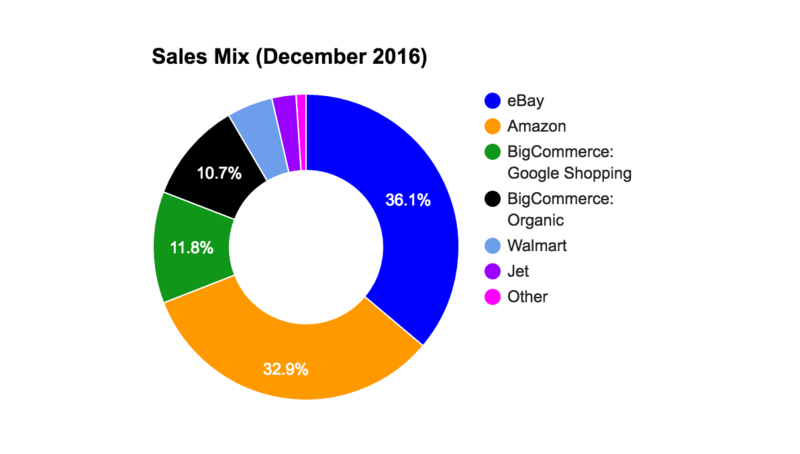 During the same period there were 109 million monthly unique visitors searching Amazon. As Amazon%u2019s position as the default product search engine strengthens, Google has been quietly building a powerful ecommerce ecosystem (Google Shopping, Google Trusted Stores) that should not be ignored. Of course, people search Google for more than products and Amazon primarily for products. As demonstrated in the previous table and the results that follow, Google serves a massive audience of consumers that are looking for your products. When properly implemented, Google’s Shopping and Trusted Stores services deliver a positive feedback loop that creates long-term value for your retail business. These services allow you to cost-effectively acquire a growing base of your own customers. On traditional marketplaces you pay a fixed commission (typically 15%) for each sale. If the same shopper purchases from you multiple times on the marketplace, you pay that commission every time. You don’t own the customer relationship. Google Shopping is best thought of as an alternative marketplace where instead of paying a fixed commission, you pay an upfront fee for shoppers to be directed to your ecommerce website. Each shopper that makes a purchase becomes your customer. If your customer has a pleasant experience, and you develop a conversation with them in the form of cost effective email marketing, there’s a good chance that customer will purchase from you repeatedly. You only pay once for a customer. Because Google monetizes on an advertising model, advertisers (retailers) need to figure out how much to bid for clicks from consumers that are browsing Google for specific products or keywords. Inexperienced advertisers with lower budgets face difficulties implementing a campaign that cost-effectively covers their catalog and collects enough data to justify further investment. Most retailers lose money on half-baked Google Shopping experiments only to retreat back to the comforts of traditional marketplace sales. Other retailers work with traditional search engine marketing firms and achieve mediocre results because incentives are not aligned. Google Shopping is overly complicated and widely misunderstood. These barriers have kept competition low and have created a major opportunity for dedicated retailers looking to reduce their reliance on marketplaces. The key to a profitable and fast growing Google Shopping channel is a carefully monitored, data-driven bid strategy. At Zentail, we’ve designed a proprietary system that uses machine learning to dynamically assign SKUs to CPC buckets based on conversion rate, profit profile, and price profile. The system continually adjusts SKU bucketing with the goal of achieving a predefined effective commission agreed to by the retailer. We call this Programmatic Google Shopping and it is proving to be an extremely powerful way to profitably grow revenue attributable to Google Shopping. Since Google Shopping requires up-front payment, once profitability is demonstrated through a stable effective commission, the retailer needs to be willing to authorize periodic increases to daily ad spend to avoid hitting an artificial ceiling in revenue generation. In March 2016, we had an onsite meeting with one of our earliest beta customers. They handed us their latest monthly report from their search engine marketing firm, the numbers were deeply concerning. The previous month had seen $3,000 in Google Shopping ad spend that generated a total of just over $3,100 in revenue. If Google were a marketplace, that would be the equivalent of paying a 97% commission -- the ecommerce equivalent of a cash incinerator. This meeting set into motion a remarkable process of iteration and experimentation that would ultimately lead to a 53.3% compounded monthly growth rate on Google Shopping, contributing over $145,000 in revenue for the month of December at an effective commission of 17%. Just ten months prior, Zentail was operating as an online retailer. We were a top 5 partner in Jet.com’s beta and fine tuning a profitable and fast-growing Google Shopping presence for our own webstore. As former online retailers, we understand the anxiety and despair symptomatic of over-reliance on marketplace channels. It’s hard enough operating profitably when 15% of every sale goes to the channel, not to mention the constant risk of suspension and ruthless competition. We could see it in their eyes how badly they wanted to own their customer base, how badly they wanted to take control of their own destiny. In reviewing the sales data that follows, it is important to note that this retailer’s industry is not influenced by holiday shopping seasonality. 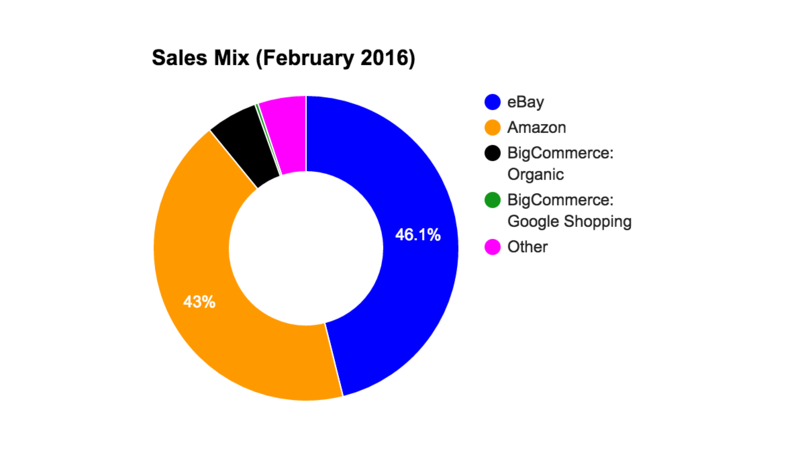 As you can see from their February 2016 sales mix, with 89% of sales coming from Amazon and eBay, if Operation Diversify and Grow was going to be a success, we had our work cut out for us. 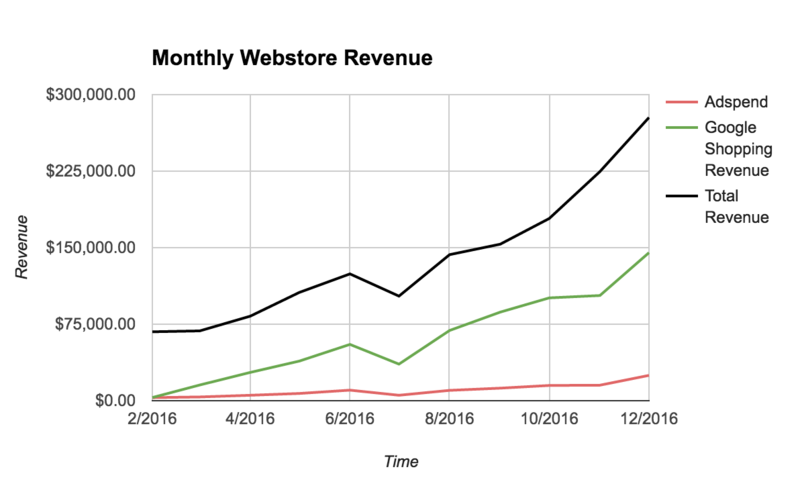 Our goal for this customer was to reach $250,000 in monthly revenue on their Bigcommerce site by March 2017. This would imply achieving roughly $150,000 in monthly revenue attributable to Google Shopping. As you’ll see from the chart below, we’d need to re-set expectations. The performance achieved thus far has opened our eyes to the value of Google Shopping. Our revised goal for this customer is $350,000 in Bigcommerce revenue for the month of March 2017, with $200,000 attributable to Google Shopping; a significant improvement from the $3,112 of revenue attributable to Google Shopping one year prior. The most important metric in ensuring a profitable Google Shopping campaign is effective commission, also known as Advertising Cost of Sales (ACoS). We calculate effective commission as your ad spend divided by your revenue attributable to the ad spend. In other words, if you spend $1,000 on Google Shopping clicks and those clicks resulted in $10,000 in revenue, your effective commission would be 10%. An effective commission of 15% is good starting point goal for Google Shopping campaigns as it roughly mirrors the commission you’d pay to Amazon, Walmart, Jet or eBay. As you’ll see later in this study; a customer acquired through Google Shopping has greater lifetime value than a customer acquired through Amazon, eBay, Walmart, etc. Therefore, you should accept a higher commission for a Google Shopping customer, significant increases in effective commission are often warranted. 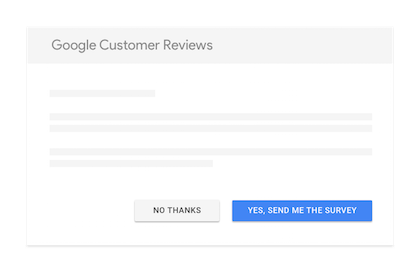 Google Customer Reviews (formerly Google Trusted Stores) is a free program which sellers can opt into in your Google Merchant Center. Customer are surveyed for their experience shopping your site. Google Customer Reviews are used in Google's Adwords programs (Google Shopping, Search Ads) to display as seller ratings to customers and also factor into Google's algorithm that determines your bid requirements and relevance. Webstores with positive Google Customer Reviews typically see meaningful increases in conversion rates, average order values and time on site. Based on data from Zentail customers, sites that display Google Customer Reviews also see increased customer lifetime value which we believe is attributable to the survey which Google emails to customers shortly after their order is placed. This communication, like other email campaigns, reinforces brand awareness and positive association. Since online shoppers have been trained to buy from Amazon and top-rated marketplace retailers they can trust, this program offers excellent value to both the shopper and retailer. After ten months our customer can almost fill an NBA arena with the unique customers they’ve acquired from Google Shopping. 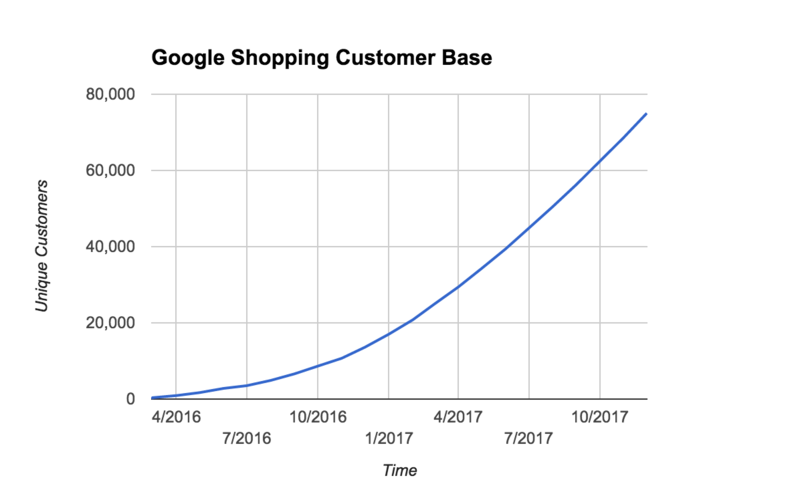 By year end 2017, we estimate our customer will have acquired over 75,000 unique customers from Google Shopping. The point here is that these are your customers. As you market to your growing base of customers originally referred by Google Shopping, your direct traffic, page rank, Google Customer Reviews, average number of orders per customer and customer lifetime value all increase. We strongly believe that Google Shopping is the most powerful platform for building a valuable, long-term defensible ecommerce business. With Google Shopping as the engine of your growth, marketplace sales become the icing on the cake. If after reading this you feel that programmatic Google Shopping can help your business, we would love to speak with you. Zentail is a multichannel software platform that makes it easy to sell on Amazon, eBay, Walmart Marketplace, Jet.com, Google Shopping, Shopify, Bigcommerce and a growing selection of channels. Centrally manage product information, listings, inventory, orders, business analytics and reordering from one beautiful interface. Leverage our Google Shopping service to grow your own webstore!